If you ever tried compost your food waste and been plagued with bad odors, rats and other vermin, then the answer to all your composting concerns have arrived! The Jora Composters – your own ecological revolution! The Jora range of composters are, without a doubt, the the most effective and efficient kitchen waste composters in the world. The Compost tumblers were designed in Sweden as they where looking for a composter that could compost all year round. The Jora Composters proven technology is helping householders reduce both the burden of waste on landfill sites and trash collection charges, while at the same time turning kitchen waste into nutritious compost that’s ready for use on the garden in just a few weeks.Recycling regulations and have been used successfully by households throughout Scandinavia for many years to compost all kitchen waste, including cooked food and meat products. Many are also in use in schools and kindergartens, where they make a good educational tool for young students. In Sweden, the JK 270 was tested and evaluated in a project comprising 466 households in small houses, apartment blocks and kindergartens. The Swedish Authority for Environment Conservation judged the performance of the machines “most satisfactory”. 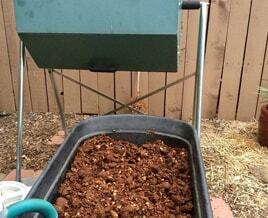 With a Jora Composter, you don’t need to be a handy gardener to be able to produce your own nutritious compost. The JK125, 270 and 400 let you make perfect compost from your kitchen waste hygienically and quickly, with minimal fuss and mess. These are typical results from the Jora Composter. We produced this during the winter when temperatures got down to below 20. It took us about 4 weeks to fill one compartment, which was then ‘maturing’ for a further 4 weeks while the other was filled – a total of 8 weeks from starting to fill with kitchen waste into its transformation into the material you see above. During the summer the process will only take about 6 weeks. This compost needs no further finishing and can be applied directly onto the garden as a soil improver or mulch. It has the same nutritional value as cow manure.